MarketPsych analyzes investing psychology. But in order to do that, we analyze language. "I think we have several more game changers in us." It was meant to reassure investors about Apple's strength for the future. Unfortunately, it conveys a sense of weakness. There are at least THREE distinct problems with his words. 1) "I think..." You "think"? So you're saying you don't know? That this is, what, like an opinion you hold? The same way you "think" your jokes are funny or you "think" Sean Connery was the best James Bond? The use of "I think" is not a confidence builder. (Nor, for that matter, is the use of "I know".) When you know something to be true, you declare it. Usually quite plainly. Imagine this isn't Tim Cook, CEO of Apple. Imagine it's Joseph Martelli, owner and head chef at Martelli's Ristorante. "I think I make the best lasagna in town." "I know I make the best lasagna in town." "I make the best lasagna in town." One sounds like he doesn't expect you to agree. One sounds like he's trying to convince himself. One sounds like he actually means it. See the difference? 2) "...several more..." You've only got a few? So the creative well is running dry then? Apple's defining characteristic has been the company's uncanny knack for producing "must have" products. Words like "several" feed into investors' biggest fear - that the company's famous ability to innovate died with its founder, Steve Jobs. What investors want to hear is that we ALWAYS have game changers in the pipeline, because we're freakin' Apple, and it's part of our DNA. Suggesting there's a few bullets left in the gun (you think) has the whiff of desperation. Moreover, the word "several" means "more than two but fewer than 'many'." In other words, it's vague, if not outright evasive. Picture yourself mingling at a cocktail party and simply trying to make friendly conversation with a guest. YOU: So do you have kids? YOU: That's great. How many do you have? YOU: Oh, several... (pause) so, does that mean you have three? GUEST: No. It means "mind your own f---ing business". Time's up. The word you find yourself wanting to insert is "left", as in we have "several game changers left in us". (You also get credit if you said the word "still"). This phrase borrows from the language of that which is being used up, that which is winding down. It the language of old racehorses ("she's still got a few more good races in her") of old ballplayers ("Jeter's still got a few more good years in him"), and beer kegs on the verge of being kicked ("It's still got a few more drops in it".) What it ISN'T is the language of leading technology companies. (NOTE: For a more Western flavor feel free to use the words, "I reckon" before the sentences above. Then picture them being spoken by Sam Elliott. Awesome, right?). HERO/HEROINE: "Please Drago, don't do this!... There is still good in you. I know it." At which point there is a dramatic pause, and then Drago orders the guillotine to come down. Or the missiles launched on New York City. Or the commissioning of a sequel to the movie, "Beaches." Some horrible thing. Which brings us back to beleaguered AAPL. Investors are looking for more than a CEO who "thinks" his company possesses "several more" good ideas 'in them'. They want strength. They want a vision. Like Fox Mulder, they want to believe. Alas, it's too late for Mr. Cook to take a mulligan. But perhaps some clarification would be in order. One in which he uses stronger language to bolster his reassurances. After all, I'm sure he still has a few good press conferences in him. And hey... let's be careful out there. FULL DISCLOSURE: I own AAPL stock. "On August 18, 1913, at the casino in Monte Carlo, black came up a record twenty-six times in succession [in roulette]. ... [There] was a near-panicky rush to bet on red, beginning about the time black had come up a phenomenal fifteen times. In application of the maturity [of chances] doctrine, players doubled and tripled their stakes, this doctrine leading them to believe after black came up the twentieth time that there was not a chance in a million of another repeat. In the end the unusual run enriched the Casino by some millions of francs." ~ From FallacyFiles.com: Darrell Huff & Irving Geis, How to Take a Chance (1959), pp. 28-29. A precious metals bullion dealer called me last year inquiring if I’d do an interview on his radio show about the psychology of precious metals prices. He explained that his customers are irrationally fearful of buying, and he was hoping I would soothe his listeners using something out of my psychological "bag o’ tricks." (Note: before you email me that this is unethical, yes, I’m aware of that, and I don’t do it). The broker said he was extremely bullish on metals prices. When I asked why he was bullish, he explained, "Silver is at three-and-a-half year lows, it can’t go any lower..." So I asked,"Why not?" and he barraged me with aggressive and profoundly confident assertions: "The U.S. Mint ran out! The demand is far greater than the ETF is holding - they own futures! Silver is an industrial metal and is not recyclable! Retail demand in India and China is just beginning!" This was the same biased reasoning about silver (and gold) that I heard from others in 2011. When such projective statements are asserted aggressively and without self-consciousness, it is a sign the bubble hasn’t fully deflated. The broker expressed a number of cognitive biases in his thinking about precious metals. I’ll discuss one here - the Gambler’s Fallacy - since it is being uttered by true believers in many quarters currently: the U.S. stock market ("can’t go any higher"), precious metals and Brazil ("can’t go lower"), and the Euro ("can’t break up") to name a few. The Gambler’s Fallacy is a bias in which investors underestimate the ability of a streak to continue, and as a result, they begin to forecast its reversal based on the length of price action in one direction alone. The reasoning of those embroiled in the Gambler’s Fallacy sounds like, "It can’t keep on going like this." It is a deeply ingrained bias, and as seen in the opening quote, enriches casinos in Roulette and other games such as Blackjack: "my losing has to turn around!" On the market-level, the Gambler’s Fallacy may influence group behavior, as evidenced by price action around series of events, such as earnings surprises. The authors of this experimental study show how prevalent the Gambler’s Fallacy is, and they differentiate it from the "Hot Hand Fallacy" in which streaks are expected to continue due to a talented human with a lucky "hot hand." Today’s newsletter examines how the Gambler’s Fallacy permeates reasoning about current market activity in the U.S. stock market, Brazil, and the Euro. Join us for a free webinar on Friday May 24th at 8am EST on Sentiment-Based Global Investing: "Inside the Global Brain: How sentiment trends in news and social media influence global equity and currency values." Register here (it’s free). Articles like this one by Peter Schiff paint a vivid picture of Fed incompetence and an impending U.S. stock market train-wreck. And such commentary is correct to say that Fed stimulus has been fueling asset prices higher, where they may be wrong is in whether or not the Fed stimulus will turn into a dead weight on the economy when it is withdrawn. The goal of the Fed stimulus was both to raise asset prices and to raise economic sentiment. When economic sentiment rises, a positive feedback loop of risk taking and borrowing is created, and economic growth becomes self-sustaining. Behind this rational analysis is the idea of "it can’t keep going up, it’s got to end" – the Gambler’s Fallacy. 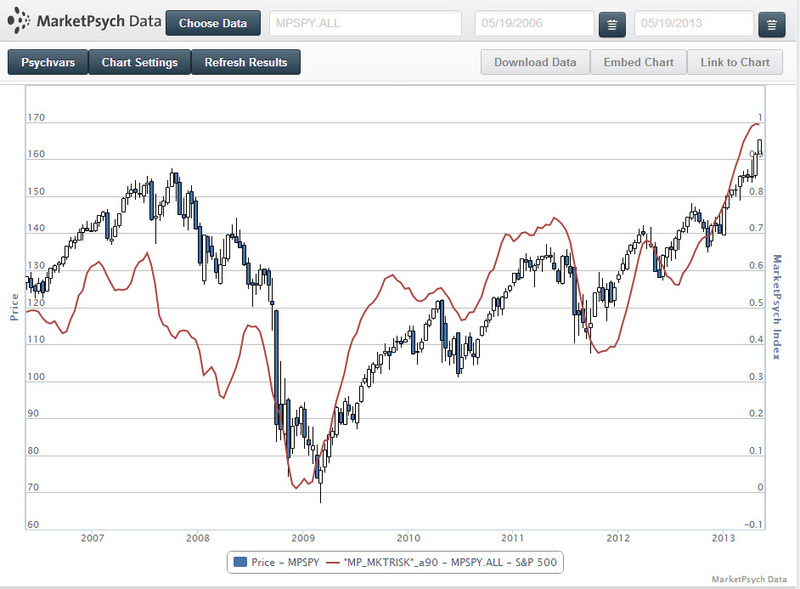 We currently see the S&P500 Bubbleometer– a.k.a. the MarketRisk index - as hitting highs in News media (but not social media). While the overall height of the index is worrisome for a year out, the divergence implies that the community of investors is still not entirely convinced of the rally, despite rapidly climbing prices. Our S&P 500 Bubbleometer is inversely correlated with future 12-month equity prices, which means this rally may be in for a pause. For timing, sell when the short-term Bubbleometer drops dramatically. We’ve used this timing tool many times, including in these June and July 2011 blog posts and this NBR interview with Dr. Frank Murtha preceeding the summer 2011 selloff. In October 2011 we called the subsequent rally based on the extreme of Fear. The Bubbleometer is a useful timing tool if you wait to sell when a convincing reversal is in store (and that is not quite yet). Before the current rally is susceptible to a correction, we need to hear much more rah-rah commentary like the below, which I agree with, by the way: "Tepper, co-founder and owner of Appaloosa Management LP, said in an interview on CNBC that he is still bullish and the economy is getting better. Tepper, who led Institutional Investor’s ranking of the top earners in hedge funds last year with $2.2 billion, said in January in a Bloomberg Television interview that the U.S. “is on the verge of an explosion of greatness." ~ Bloomberg. This is true of the U.S. economy, but not necessarily of equity prices. In the short-term positive economic momentum, and cash on the sidelines, will drive higher equity prices. According to this article, the explanation for rising prices may be as simple as supply and demand – there are fewer shares, and more money flowing into stocks. But WHY is that money flowing into stocks? Remember that emotions precede behaviors. I don’t buy stocks and then feel optimistic. That’s the wrong order. First I feel optimistic, and then I buy stocks. And as optimism rises, so follows buying. As optimism drops… And that’s when the Bubbleometer is useful. Most investors don’t sell fast enough when the bad news starts coming out. When will this rally end? When optimism begins to drop. And that drop is not yet. But stay tuned, because it is coming soon. We’ll keep you posted when that day comes. If you didn’t skip reading this section, then you’re not as tired of Euro news as I am. The past few years have been Euro-saturated. "It will crack!" "No it won’t!" "Yes it will!" Ireland, Greece, Portugal, Spain, Cyprus, Italy – all the usual suspects. Next to fall, and the lynchpin of the Euro, will be France. Why France? For the past 2 weeks our real-time metrics of French economic activity have been screaming "Sortez!" at investors. As we pointed out in this newsletter, French optimism in the midst of crisis is dangerous. Optimistic (proud?) voters are not willing to face difficult realities. Our predictions are being borne out in the slowing economic activity of France, which we believe will lead to more French political unrest and the ultimate break-up of the Euro. Our resident genius and chief data scientist Aleksander Fafula developed daily-updating economic models based on global economic activity and national sentiment reported in the news flow. 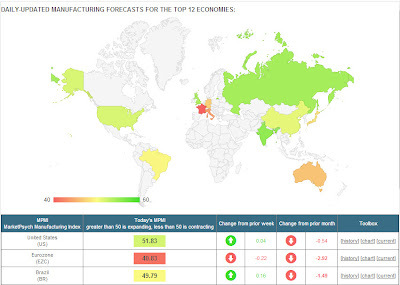 France is leading the world lower. And in the case of the United States, European stresses may again lead to a stock market downturn (the Bubbleometer is high, so we are vulnerable this summer to more Eurozone shenanigans). We’re seeing a bit of a slowdown in Brazil as well, with some evidence of the Gambler’s Fallacy. Brazil is interesting because it grew quickly under Lula through the 2000s, but now there are struggles as expectations are reset and gains consolidated. 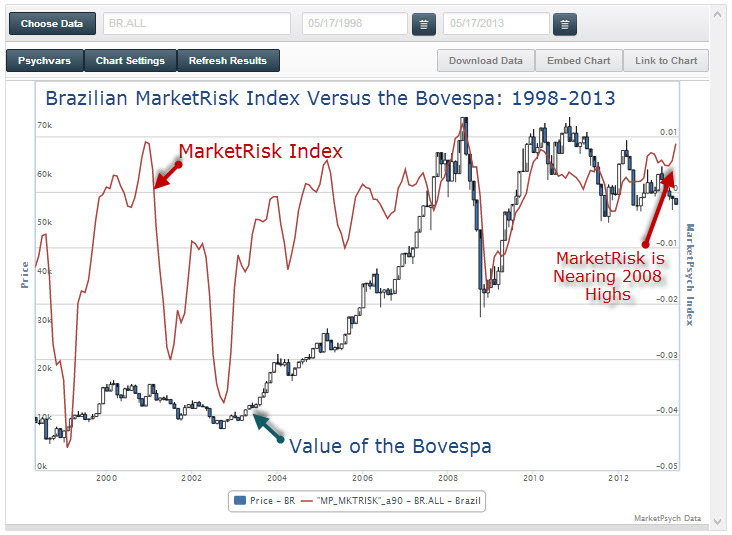 What we see here is that the declines from the Bovespa peak are not completed. We see optimism that the market will recover – mirroring the Gambler’s Fallacy – an indication of more stock market investor pain to come. This is somewhat counterintuitive to me, and I’m generally quite positive on Brazil. But that’s why we produce this data – what we want to believe is easy. What is likely to happen in markets tends to be more painful than we expect. As we pointed out in our newsletter on Gold a few weeks ago, precious metals are in a collapsing bubble. But that doesn’t mean they don’t bounce occasionally. As we stated in our Gold newsletter, after the one week rally in April, gold would roll-over. We’re in the midst of the rolling, punctuated with another one-week bounce. To those who may be influenced by the Gambler’s Fallacy and say, “Gold has to recover, the currency wars are in full swing with Japanese devaluation, etc…” I ask, “How often do markets do what they ‘have to’”? Beware gold for more than trading based on psychology. It is in dangerous long-term unwinding territory with lots of volatility to come. Our systems are this morning showing one-week buys on gold miners including junior miners (GDXJ), Iam Gold (IAG), and Silver Wheaton (SLW). The rally is already underway today, so be cautious and see the DISCLAIMER at the end. We’re also seeing a five-day short on Tesla (TSLA), everyone’s favorite car company including me. Being a favorite that already underwent a massive short-squeeze is why we’re seeing a short idea. You can see our collected research on www.marketpsychinvest.com. Users receive currency, equity, and screening models. If you’re a value investor, we can help you follow Ben Graham’s advice to buy from pessimists and sell to optimists (easier said than done, of course). Please respond to this email for a free trial. The big question is, where is the next bubble likely to emerge? It may be somewhere obvious – robotics, biotech, 3-D manufacturing, housing, aqua-culture, crypto-currency and alternative banking, and natural gas infrastructure are all places where bubbles could re-emerge over time. There are also emerging markets that remain interesting and bubble-prone, such as Pakistan (we’ve had a buy on Pakistan, to good effect, for quite a while) and sub-Saharan Africa. As in the Rumi quote above, truth is here before us. If only we summon the courage to allow ourselves to think differently. Consider the next time you are arguing for a trend because "it has always been like that." That is not seeing the future but clinging to the past. To heal, to break out of the Gambler’s Fallacy, we must abandon comfortable habit and walk face-first into the unknown. We love to chat with our readers about their experience with psychology in the markets and with behavioral economics! Please also send us feedback on what you’d like to hear more about in this area. Please contact us if you’d like to see into the mind of the market using our Thomson Reuters MarketPsych Indices to monitor market psychology for 30 currencies, 50 commodities, 120 countries, and 40 equity sectors and industries in social and news media. This data is used by top global hedge funds to improve their investment returns. Join us for a free webinar on our latest research on Friday May 24th at 8am EST on Sentiment-Based Global Investing: “Inside the Global Brain: How sentiment trends in news and social media influence global equity and currency values.” Register here (it’s free!). We have upcoming 2013 speaking engagements in New York, Orlando, London, and Chicago – we look forward to seeing our friends in those cities! Please contact Derek Sweeney at the Sweeney Agency to book us: Derek@thesweeneyagency.com, +1-866-727-7555. Both books named "Top Financial Books of the Year" by Kiplingers. Linguistic analysis paired with behavioral economics opens a new dimension for financial products and trainings. MarketPsych Data provides granular quantitative sentiment data from streaming social and news media through Thomson Reuters. Please contact us for data access and more information. Optimized to identify value over two+ years of real-time trading. 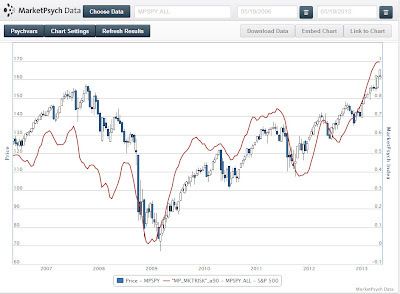 The MarketPsych Data feed includes minutely macro indices tracking reported price action, supply and demand dynamics, media expectations, and other concepts for all major countries, commodities, currencies, ETFs, and equities (over 6,000). This material is not intended as and does not constitute an offer to sell any securities or a solicitation of any offer to purchase any securities. The information of the MarketPsych Report is presented free of charge. It is no substitute for the services of a professional investment advisor. Investments recommended may not be appropriate for all investors. Recommendations are made without consideration of your financial sophistication, financial situation, investing time horizon, or risk tolerance. Readers are urged to consult with their own independent financial advisers with respect to any investment. Past performance is no guarantee of future results. Screen and model signals and related analysis are for informational and entertainment purposes only and should not be construed as an offer to sell or the solicitation of an offer to buy securities. Most financial instruments (stocks, bonds, funds) carry risk to principal and are not insured by the government. Anyone using this newsletter for investment purposes does so at his or her own risk. Data accuracy cannot be guaranteed. Opinions and analyses included herein are based on sources believed to be reliable and written in good faith, but no representation or warranty, expressed or implied, is made as to their accuracy, completeness, timeliness, or correctness. We are not liable for any errors or inaccuracies, regardless of cause, or for the lack of timeliness of, or for any delay or interruptions in, the transmission thereof to the users. As a matter of policy, we DO NOT act upon the investment information that this newsletter provides prior to making it available to the public. We currently DO NOT have an actively trading investment fund. However, it is possible that investment recommendations will be made concerning investments already present in our personal portfolios. These are not intentional. We do not actively discuss or post investment recommendations on social media in such as way as would influence our trading and investment signals. We do not accept compensation of any kind from any companies mentioned herein. MarketPsych is not responsible for any special, indirect, incidental, or consequential damages that may result from the use of, or the inability to use, the Information contained on this newsletter whether the Information is provided or otherwise supplied by MarketPsych or anyone else. Notwithstanding the foregoing, in no event shall MarketPsych total liability to you for any and all claims, damages, losses, and causes of action (whether in contract or tort or otherwise) exceed the amount paid by you, if any, for accessing this newsletter. MarketPsych expressly disclaims all warranties and conditions with regard to the Web sites, their Content, and the Information, including, without limitation, all implied warranties and conditions of merchantability, fitness for a particular purpose, title, and non-infringement. By using the Web site, Content, and Information, I assume all of the risks associated with their use, and I release and agree to indemnify and hold harmless MarketPsych from any and all liability, claims for damages, and losses arising from or connected with such risks. IF YOU DO NOT AGREE WITH ANY OF THESE TERMS AND CONDITIONS OR FIND ANY OF THEM TO BE UNACCEPTABLE, SIMPLY UNSUBSCRIBE FROM THE EMAIL LIST. If you understand and accept these caveats, feel free to read the newsletter. "Rothschild coaches careered down highways; Rothschild boats set sail across the Channel; Rothschild messengers were swift shadows along the streets. They carried cash, securities, letters and news. Above all, news---latest, exclusive news to be vigorously processed at stock market and commodity bourse." ~ Frederic Morton (1962), "The Rothschilds: Portrait of a Dynasty"
There are many stories and legends surrounding the Rothschild family, and probably most are untrue. It is widely acknowledged that Nathan Rothschild was the first Londoner to receive the news that Wellington had defeated Napoleon at the Battle of Waterloo in 1815. Rothschild received this information through his network of fast carrier pigeons, which one of his agents released from Waterloo when the battle was likely to be won. News of the outcome of the Battle of Waterloo was breathlessly awaited in the British financial markets. According to legend, when Nathan Rothschild entered into the Exchange the day of the victory, he was already known as a master of speedy information. As such he took up his usual trading position and began quietly selling British Consols (bonds) into the market. Traders quickly identified his selling, spurring a panic. It was assumed by traders that Rothschild had heard Wellington was defeated. Then, legend has it, in the midst of the panic Rothschild began stealthily buying Consols. He purchased a sizable position before traders realized they had been fooled and drove prices higher. Rothschild increased his profit from the victory dramatically by engineering a short-term panic and then buying into it. This legend serves to illustrate that there are two primary ways to profit as an investor: 1) Get important information fastest, and 2) Know how the herd will react. If you know what the investing herd believes, fears, and expects, then you know how it is likely to react to new information. Back to point 1). Getting relevant information fastest has always been the most straightforward key to successful investing. And the hunt for the fastest information has spawned the term “Algo Wars” to describe the arms race among HFTs for faster servers, co-location, re-engineered routers, and other accoutrements of light-speed trading. The time advantage HFTs use is incredibly narrow. For example, the May 1, 2013 WSJ profiles how HFTs use a 1-10 millisecond advantage to rapidly detect order-flow and front-run larger orders. At MarketPsych Data our clients include the largest hedge funds in the world, and we can’t say exactly how our clients are trading off our sentiment feed. The TRMI are published minutely as a 1440 minute (24-hour) rolling average. And several of our indices do show evidence of the #HackCrash event as you can see below. To be clear about the title question, I doubt the minutely Thomson Reuters MarketPsych Indices (TRMI) data feed contributed to Tuesday April 23rd’s HackCrash in which the S&P 500 plunged 1% and then recovered all within the span of 4 minutes. But I can’t be sure. The TRMI both show fast evidence of the event and also give an excellent read on the beliefs and expectations of the investing herd. Today’s newsletter looks at the role of information speed and herd impact. We’ll first take a look at a famous failure related to United Airlines, then we’ll visit how our systems dealt with the hacked Associated Press tweet and its aftermath, and finally we review a few investment ideas for the week. For those who criticize High Frequency Traders (HFTs) and their use of social and news media feeds for risk management, I’m going to step up in their defense about this topic. Consider that the vast majority of market makers are high frequency traders. As a market maker, every day you are buying and selling in the market for clients. That’s your job. But your job is very risky. The single biggest risk to you as a market maker is being caught flat-footed – not being prepared for a dramatic event that your clients see before you and trade against you. So you exercise risk management. In this case, like Rothschild, you need to see the defeat or victory first. HFTs are typically engineers and computer scientists, and many of them understand social media and text analytics well enough to construct simple systems that detect catastrophes reported in the news. When an Associated Press tweet contains the words: “Obama, bomb, White House, injured” – that’s an easy catch for a text analytics algorithm. And what would a market maker do in such a case? They withdraw their bids. They won’t go long if a potential catastrophe is in play. Then as selling enters the market, it causes a steep dive. When it is clear the tweet is a “hoax” or a “false alarm” or no longer corroborated by other sources, their algorithms begin to ignore the information – “all clear” they signal. And bids re-enter, stabilizing prices. This may not be a pleasant reality of the market-making system, but it is necessary for market-makers in the age of Twitter to be as fast as Twitter. Otherwise they would not survive. Do some high frequency traders also pursue Rothschild’s second key to profit, manipulating the herd? Absolutely. Look at Business Insider’s indictment of HFT’s manipulating Natural Gas prices in the low-volume seconds before inventory releases, called “Banging the Beehive.” Anxious traders are led to believe the news has been released (or someone knows more than them), and panic ensues in one direction. Limit orders and stops are filled, then prices reverse dramatically in the opposite direction. Our data satisfies the need for both of Rothschild’s insights: 1) minutely access to low-latency Thomson Reuters news and social media feeds and 2) a quantitative measure of the fears, expectations, and consensus of the market herd. The following example illustrates how the intersection of quick reactions to bad news (1) and herd fear (2) can drive enormous price moves. On September 8, 2008 a South Florida Sun-Sentinel United Airlines (UAUA) bankruptcy article from 2002 was listed onto the live Google News website as if it were current. From Google News a hurried editor at Bloomberg republished the article onto the Bloomberg news feed at 10:53 a.m. The below chart depicts the price action in UAUA (United Airlines) stock at the news of its repeated bankruptcy. High frequency traders performing text analytics on the Bloomberg news wire decimated the price of UAL in minutes. According to MarketWatch: “Trading in UAL (US:UAUA) stock was halted at about 11:06 a.m. Eastern time after falling nearly 76% to $3 a share. Shares resumed trading at about 12:25 p.m. They closed with an 11.2% loss at $10.92.” A dramatic daily loss occurred for UAUA despite the released information being 6 years old. News analytics has been a robust business since the mid-2000s. Firms including Thomson Reuters, Bloomberg, and Dow Jones offer low-latency news feeds. Thomson Reuters and Dow Jones (indirectly) offer pre-analyzed feeds with low-latency sentiment tagging. In the past two years social media has been added into the low-latency news mix, including our own product with Thomson Reuters. The #HackCrash is remarkable because it occurred due to social media. Despite the prevalence of trading on social media (including our own fund, which was the first), social media communications have never before impacted markets so significantly. As you can see, the fall was fast and the recovery even more dramatic. So what, if any, was our role in the event? 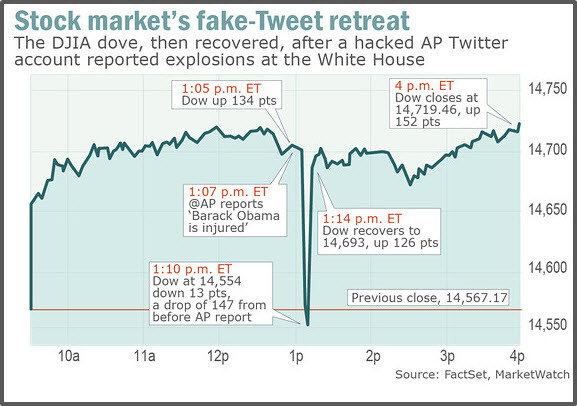 We saw movement in several of our indices after the incriminating AP Tweet was released. To be clear, we and most other text analytics firms have screens to detect when information being conveyed is explicitly false. For example, when information about an event is qualified as a “hoax,” “fake,” or “false alarm” our systems ignore the indicated content of the message (it is not scored). 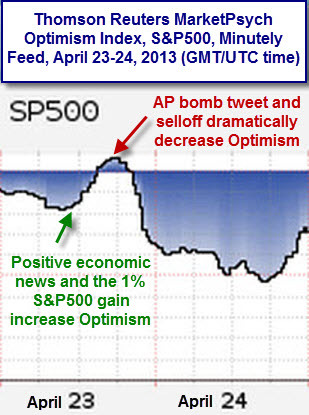 So when we looked at our minutely Thomson Reuters MarketPsych Indices for the S&P 500 and the United States using combined social and news media content, we see interesting evidence of the event, but only a tiny – almost imperceptible - blip indicating that there was an attack, as it was quickly discredited. Below are visuals showing both the long-term and the short term impacts of the event on our relevant sentiment feeds. In these charts, keep in mind that you are seeing a 24-hour average (1440 minute rolling average). On a minutely level the action is much more dramatic. Nonetheless, it can be seen here as well. In the big picture, we note that the Thomson Reuters MarketPsych Optimism Index for the S&P 500 fell steeply following the fake AP tweet and the market price tremor. 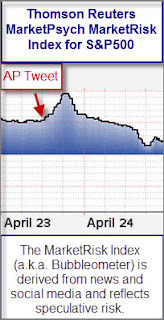 The following chart depicts a 48-hour period in GMT/UTC time from April 23rd through April 24th. (GMT time is currently 4 hours ahead of the U.S. East Coast time zone). The decreased Optimism was fairly short-lived, lasting for about 24-hours. Over the course of minutes we saw rapid dissemination of the event reflected in our S&P 500 PriceUp index (PriceUp is a net of references to prices rising or falling). Conversations about the price first falling and then rising were rapidly disseminated through social and news media. As a result of the language used to describe the event, we saw the Thomson Reuters MarketPsych MarketRisk index surge. 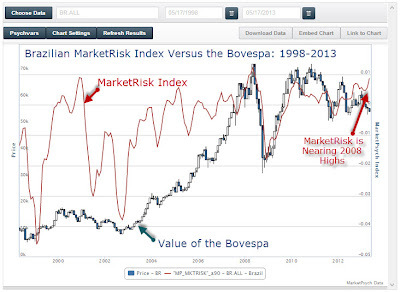 The MarketRisk index measures emotive and speculative conversations that tend to predict riskier markets to come. Though it surged for a few hours, it declined rapidly thereafter as concerns faded. The above graphics display our findings around the S&P 500 and its constituents. In our United States data feed, we noticed a rise in Anger at the United States government. The report of Syrian hackers posting the tweet due to anger at the U.S. Government’s support for the Free Syrian Army was accurately scored. Because the news of the alleged perpetrators and their motivation arrived late, it does not appear as a dramatic jump but rather a slow rise in the index over 24 hours. The event was an odd event – it wasn’t an ACTUAL attack. For example, it should not have appeared in our United States Violence index. And it didn’t - it registered only as a tiny blip due to it being quickly identified as a fake. That said, the price reaction did impact investor perceptions, for example the event increased pessimism significantly over 24 hours. How was this event trade-able? I’d say that in the 1440 minute average, it likely was not. That said, on a raw minutely level the action was very interesting. Our underlying sentiment feed is perfect for market-maker risk management uses. If you’re a market maker, let me know if you’d like more information about how to use our data to quickly identify and avoid risks. None of our ideas this week are related to the #HackCrash. We’re currently seeing a one-week sell on Trina Solar (TSL). We also see a one-week sell on Herbalife (HLF) – a surge of excitement in that stock likely to peak this week. SEE DISCLAIMER at end of email. These ideas were developed using backtesting and a hedge against the S&P500, but you invest at your own risk. Last week’s Buys on GLD, GDX, SLW, and ABX went well, with all being significantly positive on the week (I’ll quantify these later). There were no shorts last week. I’ll give exact stats on recommendations in another newsletter. We are adding a monthly individual U.S. stock sentiment-based investment model and a Russell 1000 sentiment ranking system to www.marketpsychinvest.com. Users will be able to follow Ben Graham’s advice to buy from pessimists and sell to optimists (easier said than done, of course). Please respond to this email for a free trial. Keep in mind Rothschild’s stratagem as you go forward. If you don’t have the fastest information in the market, then you’ve got to know the herd. What are they thinking and feeling, and how are they likely to react to the next news release or major event? Please contact us if you’d like to see into the mind of the market using our Thomson Reuters MarketPsych Indices to monitor market psychology for 30 currencies, 50 commodities, 120 countries, and 40 equity sectors and industries in social and news media. This data is used by top global hedge funds to improve their investment returns. Please let us know if you’d like to learn more. We have upcoming 2013 speaking engagements in New York, Orlando, London, Chicago, and San Francisco – we look forward to seeing our friends in those cities! Please contact Derek Sweeney at the Sweeney Agency to book us: Derek@thesweeneyagency.com, +1-866-727-7555.